Final Redaction of Talmud Due to Saboraim. Title applied to the principals and scholars of the Babylonian academies in the period immediately following that of the Amoraim. According to an old statement found in a gloss on a curious passage in the Talmud (B. M. 86a), Rabina, the principal of the Academy of Sura, was regarded as the "end of the hora'ah," i.e., as the last amora, while Sherira Gaon, in his letter (ed. Neubauer, "M. J. C." i. 25), dates the beginning of the activity of the Saboraim from the day of Rabina's death, which he gives as Kislew 13, 811 of the Seleucidan era = Dec. 2, 499 (ib. i. 34). He says also (ib. ), alluding to Rab Jose, Rabina's contemporary at Pumbedita: "In his days the hora'ah was completed, and the Talmud was concluded. Then followed the Saboraim, most of whom died within a few years, as the Geonim have said in their historical notes." The period of the Saboraim was, therefore, brief. In harmony with this, the statement just cited is followed in an ancient authority, the "Seder Tanna'im wa-Amora'im" (Neubauer, l.c. i. 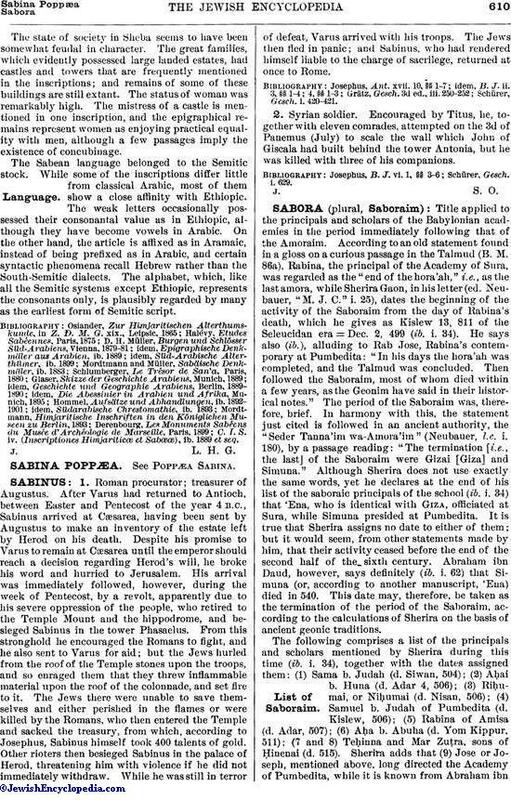 180), by a passage reading: "The termination [i.e., the last] of the Saboraim were Gizai [Giza] and Simuna." Although Sherira does not use exactly the same words, yet he declares at the end of his list of the saboraic principals of the school (ib. i. 34) that 'Ena, who is identical with Giza, officiated at Sura, while Simuna presided at Pumbedita. It is true that Sherira assigns no date to either of them; but it would seem, from other statements made by him, that their activity ceased before the end of the second half of the sixth century. Abraham ibn Daud, however, says definitely (ib. i. 62) that Simuna (or, according to another manuscript, 'Ena) died in 540. This date may, therefore, be taken as the termination of the period of the Saboraim, according to the calculations of Sherira on the basis of ancient geonic traditions. The following comprises a list of the principals and scholars mentioned by Sherira during this time (ib. i. 34), together with the dates assigned them: (1) Sama b. Judah (d. Siwan, 504); (2) Aḥai b. Huna (d. Adar 4, 506); (3) Riḥumai, or Niḥumai (d. Nisan, 506); (4) Samuel b. Judah of Pumbedita (d. Kislew, 506); (5) Rabina of Amisa (d. Adar, 507); (6) Aḥa b. Abuha (d. Yom Kippur, 511); (7 and 8) Teḥinna and Mar Zuṭra, sons of Ḥinenai (d. 515). Sherira adds that (9) Jose or Joseph, mentioned above, long directed the Academy of Pumbedita, while it is known from Abraham ibnDaud (ib. i. 61) that he died in 513; so that there, as elsewhere, Sherira gives him the title of gaon as a director of the pre-geonic period. The list concludes with the names of (10) 'Ena (i.e., Giza), (11) Simuna, and (12) Rabbai of Rob, who was described by some authorities as a gaon or principal. In another passage (ib. i. 25) Sherira enumerates the following Saboraim: Nos. 3, 9, 6 (Aḥa of Be-Ḥatim, a city in the vicinity of Nehardea, mentioned in Giṭ. 7a), 12 (with the statement that Rob likewise was a city in the vicinity of Nehardea, and that a remark by Rabbai of Rob was introduced into the text of the Talmud, Sanh. 43a; see "Diḳduḳe Soferim," ix. 125), 10, and 11. In Abraham ibn Daud's historical narrative, which as late as the nineteenth century was regarded as an authority for the period of the Saboraim, this period is extended to the year 689, this authority assuming that Ḥinena of Nehar Peḳod, the principal of the Academy of Pumbedita (from 689 to 697), was the first of the Geonim, and that all preceding directors must be regarded as Saboraim. Of the latter he enumerates five generations. The first of these is represented by the single name of Mar Jose (No. 9 in foregoing list), who officiated fourteen years after the completion of the Talmud or, in other words, after Rabina's death. The second generation includes the following Saboraim mentioned by Sherira: Nos. 2, 4 (here called Samuel b. Rabba); Nos. 5, 7 (Taḥnina; variant, Teḥinta); Nos. 11, 10. The pupils of Nos. 11 and 10 constituted the third generation; but their names are unknown, because, as Ibn Daud remarks, the academy had been closed for about fifty years at that period. The last three generations, which, however, are not designated as the fourth, fifth, and sixth, but as the third, fourth, and fifth generations, included the principals of Sura and Pumbedita, who, according to the correct interpretation of Sherira's statements, were the geonim that officiated between 589 and 689 (see Jew. Encyc. v. 571). 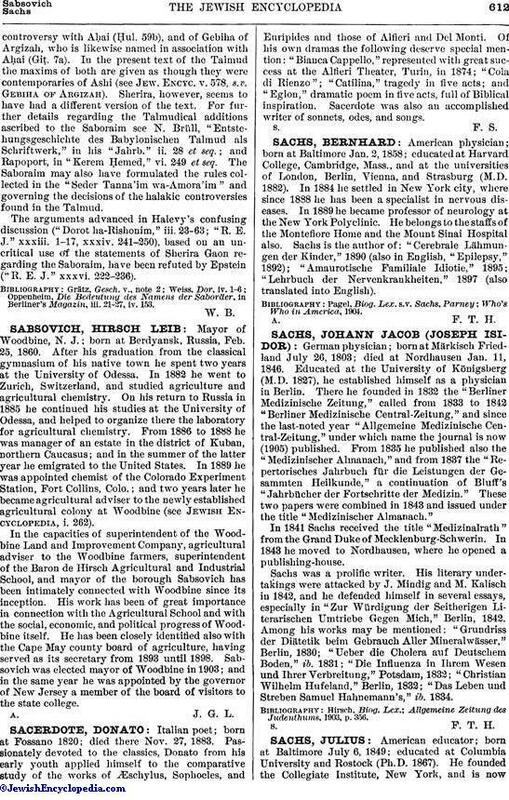 A noteworthy list of the Saboraim is found in the two versions (edited by Neubauer, l.c. i. 177, ii. 246) of an old source based on the "Seder 'Olam Zuṭa" and the "Seder Tanna'im wa-Amora'im." One of these versions has the following Saboraim mentioned by Sherira: No. 6 (instead of and read ); Nos. 1, 4, 5, 7 ( and , corrupted from ; No. 8. It names also Aḥai b. Nehilai (possibly identical with No. 2), Gebiha of Argizah (one source has , and the other ; this is the Gebiha of mentioned in Giṭ. 7a), and Aḥdeboi. The same list is also found in a version of Sherira's letter, shorter in form, despite its spurious additions (Neubauer, l.c. i. 46). The activity displayed by the Saboraim is described by Sherira, (ib. i. 25) in the following terms: "Afterward [i.e., after Rabina] there was probably no hora'ah [i.e., no independent decision based on the interpretation of the Mishnah], but there were scholars called Saboraim, who, rendered decisions similar to the hora'ah, and who gave clear explanations of everything that had been left unsettled." 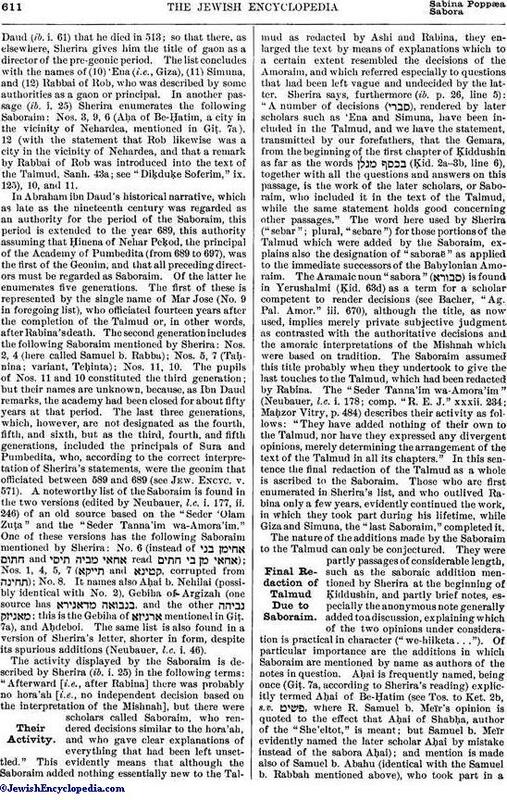 This evidently means that although the Saboraim added nothing essentially new to the Talmud as redacted by Ashi and Rabina, they enlarged the text by means of explanations which to a certain extent resembled the decisions of the Amoraim, and which referred especially to questions that had been left vague and undecided by the latter. Sherira says, furthermore (ib. p. 26, line 5): "A number of decisions ( ), rendered by later scholars such as 'Ena and Simuna, have been included in the Talmud, and we have the statement, transmitted by our forefathers, that the Gemara, from the beginning of the first chapter of Ḳiddushin as far as the words (Ḳid. 2a-3b, line 6), together with all the questions and answers on this passage, is the work of the later scholars, or Saboraim, who included it in the text of the Talmud, while the same statement holds good concerning other passages." The word here used by Sherira ("sebar"; plural, "sebare") for those portions of the Talmud which were added by the Saboraim, explains also the designation of "saboraë" as applied to the immediate successors of the Babylonian Amoraim. The Aramaic noun "sabora" ( ) is found in Yerushalmi (Ḳid. 63d) as a term for a scholar competent to render decisions (see Bacher, "Ag. Pal. Amor." iii. 670), although the title, as now used, implies merely private subjective judgment as contrasted with the authoritative decisions and the amoraic interpretations of the Mishnah which, were based on tradition. The Saboraim assumed this title probably when they undertook to give the last touches to the Talmud, which had been redacted by Rabina. The "Seder Tanna'im wa-Amora'im" (Neubauer, l.c. i. 178; comp. "R. E. J." xxxii. 234; Maḥzor Vitry, p. 484) describes their activity as follows: "They have added nothing of their own to the Talmud, nor have they expressed any divergent opinions, merely determining the arrangement of the text of the Talmud in all its chapters." In this sentence the final redaction of the Talmud as a whole is ascribed to the Saboraim. Those who are first enumerated in Sherira's list, and who outlived Rabina only a few years, evidently continued the work, in which they took part during his lifetime, while Giza and Simuna, the "last Saboraim," completed it. The nature of the additions made by the Saboraim to the Talmud can only be conjectured. They were partly passages of considerable length, such as the saboraic addition mentioned by Sherira at the beginning of Ḳiddushin, and partly brief notes, especially the anonymous note generally added to a discussion, explaining which of the two opinions under consideration is practical in character ("we-hilketa . . ."). Of particular importance are the additions in which Saboraim are mentioned by name as authors of the notes in question. Aḥai is frequently named, being once (Giṭ. 7a, according to Sherira's reading) explicitly termed Aḥai of Be-Ḥatim (see Tos. to Ket. 2b, s.v. , where R. Samuel b. Meïr's opinion is quoted to the effect that Aḥai of Shabḥa, author of the "She'eltot," is meant; but Samuel b. Meïr evidently named the later scholar Aḥai by mistake instead of the sabora Aḥai); and mention is made also of Samuel b. Abahu (identical with the Samuel b. Rabbah mentioned above), who took part in acontroversy with Aḥai (Ḥul. 59b), and of Gebiha of Argizah, who is likewise named in association with Aḥai (Giṭ. 7a). In the present text of the Talmud the maxims of both are given as though they were contemporaries of Ashi (see Jew. Encyc. v. 578, s.v. Gebiha of Argizah). Sherira, however, seems to have had a different version of the text. For further details regarding the Talmudical additions ascribed to the Saboraim see N. Brüll, "Entstehungsgeschichte des Babylonischen Talmud als Schriftwerk," in his "Jahrb." ii. 28 et seq. ; and Rapoport, in "Kerem Ḥemed," vi. 249 et seq. The Saboraim may also have formulated the rules collected in the "Seder Tanna'im wa-Amora'im" and governing the decisions of the halakic controversies found in the Talmud. The arguments advanced in Halevy's confusing discussion ("Dorot ha-Rishonim," iii. 23-63; "R. E. J." xxxiii. 1-17, xxxiv. 241-250), based on an uncritical use of the statements of Sherira Gaon regarding the Saboraim, have been refuted by Epstein ("R. E. J." xxxvi. 222-236). Oppenheim, Die Bedeutung des Namens der Saboräer, in Berliner's Magazin, iii. 21-27, iv. 153.